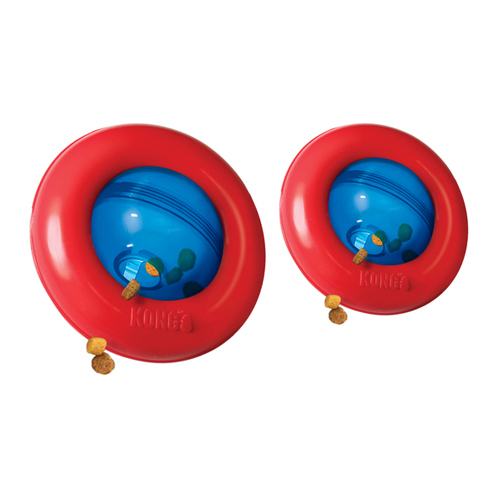 The KONG Gyro is a treat toy that makes rolling and tilting movements when your dog plays with it. This releases tasty snacks or chunks of dry food. The Gyro is available in two sizes: Small and Large. With the KONG Gyro, your dog can entertain itself for hours. You can hide rewards or dry food in the toy by pushing it through the hole. When your dog touches the Gyro with its nose or paw, it will roll and tilt, and the treats will come out of the ball. The Gyro consists of a static outer red ring with a moving blue ball inside of it. Have you used KONG Gyro before? Let us know what you think about this product.